Can we expect a Greek installment of the Assassin's Creed series? 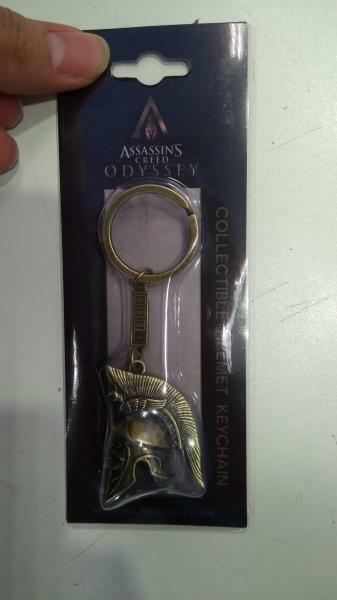 A leaked image posted today on the French video game site jeuxvideo-live.com which shows a keychain for Assassin’s Creed Odyssey. There’s been no announcement from Ubisoft regarding the next entry in the Assassin’s Creed series. Does this keychain mean an announcement for Assassin’s Creed Odyssey be in the works? The keychain comes from a user who goes by the alias Arcticblue. According to Arcticblue, Assassin’s Creed Odyssey is a follow-up to Assassin’s Creed Origins. Judging by the name, and the helmet design of the keychain, Odyssey will likely take place in Ancient Greece. For those eager to jump on the Assassin’s Creed Odyssey hype train, a confirmation of the game may not be that far off. Ubisoft will host their annual press conference at E3 2018, during which it’s possible they may confirm Assassin’s Creed Odyssey as the next title in the series. Even if Odyssey is nothing more than a rumor, we’re nevertheless due for a new Assassin’s Creed game. What that game could be is anyone’s guess. To be honest, we wouldn’t be opposed to the idea behind Assassin’s Creed Odyssey, especially coming from the Ancient Egypt setting of Origins. We’ll let you check out the keychain and decide for yourself whether or not it’s legitimate. Are you excited about the possibility of Assassin’s Creed Odyssey, or would you prefer to wait until Ubisoft makes an official announcement at E3 2018? Let us know down in the comments below!